U.S. citizens based their dueling codes on the Code Duello of Ireland. This Irish code of 1777 contained twenty-six commandments covering all aspects of a duel. It included ways to avert a duel, such as the manner in which to apologize when one had committed a duel-provoking offense. If a duel could not be avoided, the scenario was a familiar one: usually, opponents would stand back-to-back, then pace a set number of steps away from each other, turn, and shoot. The Code Duello declared, "The aggressor must either beg pardon in expressed terms … or fire on until a severe hit is received by one party or the other." 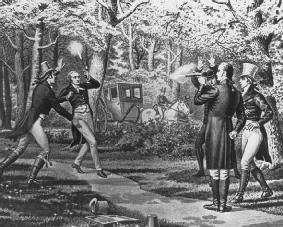 In the United States, less strict variations of the Code Duello allowed the contest to end without bodily injury, providing for some form of public mockery for the contestant who sought to end the duel. The coincidence between the decline of congress as the voice of public opinion and that of dueling suggests the connection between honor and the historical construction of the public sphere in Mexico. He shows how women, who were the causus belli of most serious duels, were defended in this system of gallantry only in their capacity as the possessions and child-bearers of their "noble" consorts, and he provides a thorough account of dueling etiquette and the hardware gentlemen used in their affairs of honor. Firearms, including pistols, rifles, and shotguns, were the most popular dueling weapons. Five points stand out: (1) the overall rate of dueling canon or interpretive tool use in the Roberts Court's first five terms was low--at or below 25. Come to Sopranos Dueling Piano Bar on Sunday, January 26th and help Jen and Sopranos get a few paw prints closer to that goal. JG: The variety of dueling parties is nothing short of stunning: Abel v.
There is no law against dueling in France," Renaud said. In her book, Dueling Students: Conflict, Masculinity, and Politics in German Universities, 1890-1914, Lisa Fetheringill Zwicker challenges the scholarship of the past forty years and offers a different analysis of Imperial German universities and their student body. Fernando Diaz-Plaja observes that dueling maintained a more influential role in Spain than in the rest of enlightened Europe, particularly because of the pull of societal opinion, or el que diran (233). By contrast, we contend that dueling contains a rational core that can be modeled. It is therefore not surprising that Italian military officers had the highest dueling rates of any category; despite an "official" disapproval of the duel, a man who refused a legitimate challenge from a brother officer, who did not leap to defend the honor of his corps, was summarily cashiered. Yaqub's fascinating study of oral poetry addresses poetry dueling as a performative and compositional device and considers the social efficacy of poetry dueling, its aesthetic nature, and its value as a compositional device within a larger system of poetic production.